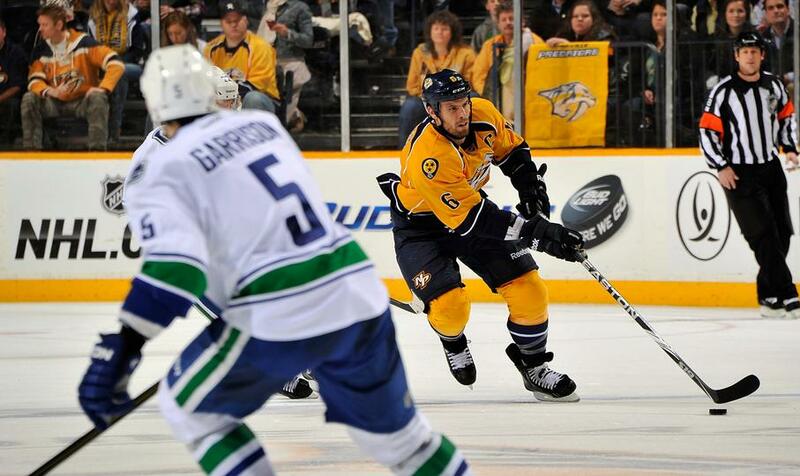 The Vancouver Canucks wrap-up their 4-game road trip tonight against the Nashville Predators. This is the first of 3 meetings between the two teams. Last season, the Canucks won all 3 games against the Predators. With their Sunday morning win against the Carolina Hurricanes, the Canucks have won 2 of the 3 games on the road trip so far, and it would be good to head home for their 5-game homestand on a winning note. On the other hand, the Predators have lost their last 2 games; they were shutout by the Edmonton Oilers on Thursday and lost to the Philadelphia Flyers in a shootout on Saturday. After ending his 24-game point drought on November 23rd against the Chicago Blackhawks, Canucks defensemen Jason Garrison has been on fire. He has 6 points (1 goal and 5 assists) in his last 5 games. For the Predators, Mr. Carrie Underwood, Mike Fisher, has 3 goals in his last 4 games. Fisher also opened the scoring for the Predators on Saturday against the Flyers. Once again, the Canucks will be without forward Alexandre Burrows who is out indefinitely with a broken jaw. Forward Jordan Schroeder is still out with a sprained ankle, though he is expected to return in mid-to-late December. The Predators will be without the bearded one, Shea Weber (eye), and Kevin Klein (lower body). Forward Filip Forsberg (upper body) has been placed on injured reserve. Shooting From the Hip With @suitoflights: Welcome Back, NHL!